It is one of the most compact and portable dry herb vapes to ever reach the market. The Goboof Alfa is a great choice for anyone who desires a small and easy to use design. It comes with the basic performance to keep them satisfied. It comes in at a slightly large price tag of $99. Let’s take a look at the vaporizer and see what it can do. Disclosure: All the dry herb vaporizers which we review on this website are tested by our trained, paid staff. As part of the review, VapingDaily.com links directly to the product or brands so that you may purchase directly from the provider. We receive commissions from these providers, however, this does not affect the price you pay, and the commissions we earn help us pay for the costs of running this website. Click here to learn more. Thank you. 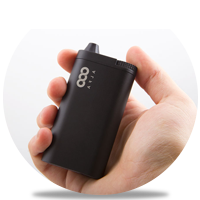 One of the main selling points of the Goboof Alfa is its simple, compact and portable design. When taking this into consideration, this device is actually really good looking. This device will give even the most casual user a really nice device to hold. Meanwhile, it manages to find a place to put all the features and functionality available with the device. Alfa vaporizer by Goboof has a minimalist design with just a few external parts: a silicone rubber mouthpiece, a heat settings dial, and a herb chamber at the bottom with a flip top. It is a very compact gadget, which makes it easy to hold in your hand. It’s also very lightweight, so we can assume that it’s not very sturdy. While the vaporizer might look just like any other vaporizer on the market, it is the herb chamber that makes it unique. It has an additional pin, right in the middle of the oven which is not very common. In fact, I remember I have seen only two other vaporizers: Whisper Vape and Iolite Vaporizer that had a similar herb chamber. The pin has twofold benefits: firstly, it makes sure that the herbs stay in the right place and don’t move around when you shake the vaporizer; secondly, it generates heat right in the middle of the oven in addition to the heat coming from the sides, which makes sure you get an rich, smooth flavor. The pin, however, comes at the price of extra effort required to clean the chamber. The Goboof Alfa has a really nice size and weight to it, with the measurements being 3.43in x 1.9in x 0.75in. In addition, the weight comes in at only 105g, it really is a pocket size device. The small design and weightless structure will let you carry this device around without any inconvenience. Manual Heat Settings – You have the ability to choose between 5 presets; 3 manual heat settings and 2 automatic heat settings. As a result, this gives you the ability to change the temperature depending on the dry herb you’re using. Automatic Shutoff Features – This is becoming more and more common when it comes to these dry herb vaporizers. We mean having the automatic power off feature gives you peace of mind. You can relax knowing that you don’t have a 400-degree oven cooking in your pocket. After 10 minutes of Idle time, it will turn off. In fact, this also helps save on battery life. The performance of Alfa greatly depends on how well you use it. When you turn it on, it takes about 30 seconds to heat up. According to our experience, it gives the best flavor when used at LOW or MID heat, and gives a harsh, burnt taste at HI. Also, the more finely ground and tightly packed your herbs are, the better taste you’ll get. It offers the best taste if you take smaller puffs. For instance, if you puff on it for longer than eight seconds, you will not get as good a taste as you’ll get if you puff it for four to six seconds. You get a burnt taste probably because the oven and the pin generate too much heat if you take longer puffs. The Goboof Alfa has some pretty decent performance. You will get the ability to control the temperature. Therefore, it gives you a lot more control over the performance and vapor production of this device. You’ll be able to reach a decent performance regardless of the heat setting you’re using and it’s consistent throughout. The vapor production, as mentioned above, will change depending on the heat setting you’re using. This is along with the dry herb you choose to smoke. You can expect a well flavored dense vapor production when using this device. However, when using this device on high temperature presets you could burn the dry herb quicker. This is if it’s not meant to be vaped at that temperature. When using the manual heat settings, make sure you understand how to do it correctly. You’ll be able to get a full days use out of this device. However, you should know that the charging time can take a significant amount of time. Due to the Goboof Alfa being a portable design this isn’t the greatest. However, taking into consideration the hardware it uses, one can understand that. It’s safe to say the Goboof Alfa wins the fight for best portable and compact vaporizer on the market. It really excels in performance and overall design and quality. There’s simply no other devices that offer this much functionality and features. As a result, it makes this device one of the best options; providing you’re happy to pay $99 for it. It’s important to keep your device clean and well maintained. In fact, failure to do so will more than likely reduce the total life span of your vaporizer. Not cleaning the device will also affect your vapor production and taste from the vape. You should make sure you clean the chamber after every use (once the device is cool). You can do this by using the cleaning kit provided with the kit. You can find information on how to do this in the user manual. It’s advised to wipe down the outside of the device. This will stop any buildup of dust getting into the features that require movement (variable temperature switch). If you get dust inside, it could stop functioning correctly. You will need quite a bit of information to fully get this device working and understanding it correctly. Therefore, you will get the device to its full potential. You will get a quick start guide that you can use to understand the basics of the device. Make sure you read this before using the device. You can also find more additional information in the user manual provided with this device. Any further and in-depth information that you need will more than likely be available in the user manual. Although you don’t have to read it all, I would still give it a flick through and just get familiar with the basics and the contents in it. With the Goboof Alfa costing around $99 the device is on the slightly higher end of vaporizer prices. I believe it’s worth it with the quality this device brings. The overall design and construct of this device are outstanding. The compact and portable design works well. The Goboof Alfa performs well, slight problems with the battery recharge time but besides that it’s amazing. The VaporBlunt 2.0 has one of the bluntest names in all of vaporizers. But in all reality, this is a really high quality product. Read on to find out more. The Atmos Vicod 5G is not just a good looking device. It hosts some of the latest and greatest hardware in the vaping market. Find out more here.